The CleanFinancial.com guide to spread betting on Reckitt Benckiser shares. Where Can I Spread Bet on Reckitt Benckiser? Where to Trade Reckitt Benckiser Shares for Free? 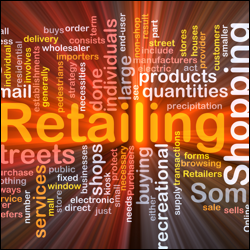 Where to Practice Trading Reckitt Benckiser Shares? How to Spread Bet on Reckitt Benckiser? Note that you may also be able to take a position on Reckitt Benckiser on other websites. For the latest UK broker ratings see Daily Trading Tips. Where Can I Find Live Prices and Charts for Reckitt Benckiser? The real-time CFDs chart and prices below will provide readers with a handy guide to the Reckitt Benckiser share price. The above chart, provided by Plus 500, usually shows the Reckitt Benckiser futures contract (not the spot price). To gain access to financial spread betting prices and charts for Reckitt Benckiser, an option is to use a spread betting account. A spreads account also gives you access to the shorter-term spot markets. Note that opening an account is normally dependent on suitability, status and credit checks. Should your application be approved then, after logging in, you will be able to review the real-time prices and charts. On most platforms, these are provided as part of the service. The catch? You're likely to get the odd letter and/or email from the relevant financial spread betting firm. Of course, if you do decide to trade, be aware that spread betting and contracts for difference involve a high degree of risk to your funds and you could lose more than your initial investment. See below for more on advanced Reckitt Benckiser charts. The UK stock is currently trading higher than the 20 day moving average of 6842.7p and lower than the 50 day moving average of 7138.9p. Price data from Google Finance. Also see Live RB.L Share Price & Charts and About Reckitt Benckiser for more information. Where Can I Spread Bet on Reckitt Benckiser for Free? Speculating on the markets involves a degree of risk, but if you want to open a completely free Practice Account, that allows you to try spread betting on a variety of markets, then see below for further details. When considering which trading option is right for you, also remember that in the UK, spread betting is free of capital gains tax, income tax and stamp duty*. All of the above currently provide a Practice Account which investors can use to review charts, test new strategies and apply orders. Should you want to invest in companies like Reckitt Benckiser then one possibility could be to spread trade on the Reckitt Benckiser share price. Whilst making a spread bet on UK equities you trade in £x per penny. So, if you choose to have a stake of £3 per penny and the Reckitt Benckiser share price moves 36p then that would alter your profits (or losses) by £108. £3 per penny x 36p = £108. Be aware that this is a Rolling Daily Market and so there is no preset settlement date for this market. If your position is still open at the end of the day, it will just roll over into the next trading session. You can learn more in our feature Rolling Daily Spread Betting. Then you could choose to go long of the market at 3647.9p and risk, for the sake of argument, £3 per penny. With such a bet you win £3 for every penny that the Reckitt Benckiser shares move higher than 3647.9p. Of course, you will make a loss of £3 for every penny that the Reckitt Benckiser market falls lower than 3647.9p. Looking at this from another angle, should you ‘Buy’ a spread bet then your P&L is found by taking the difference between the closing price of the market and the price you bought the market at. You then multiply that price difference by your stake. Trading equities, by spread betting or otherwise, can go against you. With this example, you wanted the share price to increase. Naturally, it can also go down. If the Reckitt Benckiser share price had fallen then you might decide to close/settle your trade in order to limit your losses. Note: Reckitt Benckiser Rolling Daily spread betting market accurate as of 19-Oct-12. Advert: Reckitt Benckiser Spread Betting, sponsored by FinancialSpreads.com. You can spread bet on Reckitt Benckiser with Financial Spreads. Barclays spread betting and trading guide with live BARC prices and charts. Plus, daily updates, broker recommendations on Barclays, where to spread bet on the UK shares tax-free* and commission-free, how to trade... » read guide. BP spread betting and trading guide with live LON:BP share prices and charts. Plus, daily updates, broker recommendations, where to spread bet on the UK shares tax-free* and commission-free, how to trade... » read guide. HSBC spread betting and trading guide with live HSBA.L prices and charts. Plus, daily updates, broker recommendations on HSBC, where to spread bet on the UK shares tax-free* and commission-free, how to trade... » read guide. 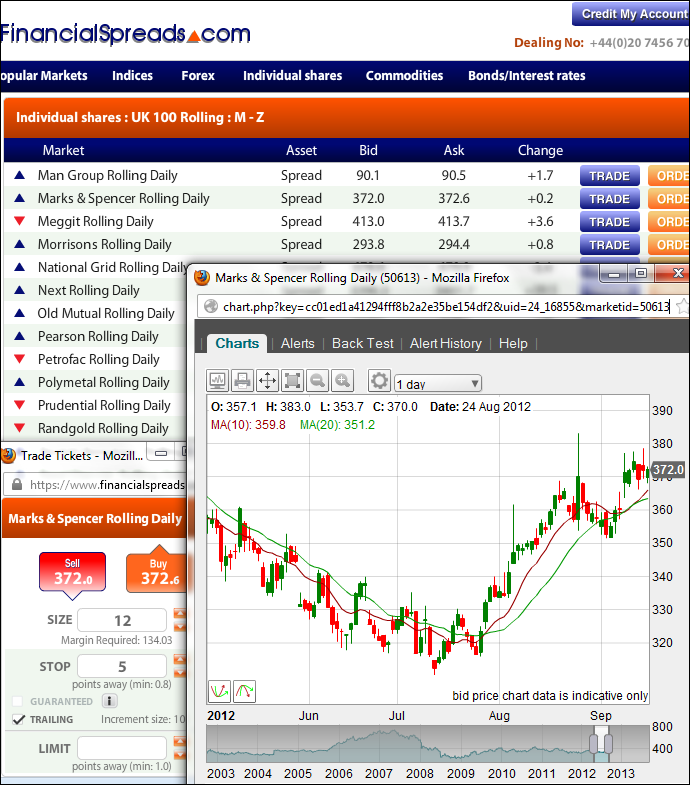 Royal Mail spread betting and trading guide with live RMG prices and charts. Plus, daily updates, broker recommendations on Royal Mail, where to spread bet on the UK shares tax-free* and commission-free, how to trade... » read guide. Lloyds spread betting and trading guide with live LLOY prices and charts. Plus, daily updates, broker recommendations on Lloyds, where to spread bet on the UK shares tax-free* and commission-free, how to trade... » read guide. RBS spread betting and trading guide with live RBS prices and charts. Plus, daily updates, broker recommendations on Royal Bank Of Scotland, where to spread bet on the UK shares tax-free* and commission-free, how to trade... » read guide. Rio Tinto spread betting and trading guide with live LON:RIO share prices and charts. Plus, daily updates, broker recommendations, where to spread bet on the UK shares tax-free* and commission-free, how to trade... » read guide. Vodafone spread betting and trading guide with live VOD prices and charts. Plus, daily updates, broker recommendations on Vodafone, where to spread bet on the UK shares tax-free* and commission-free, how to trade... » read guide. Reckitt Benckiser spread betting and trading guide with live RB prices and charts. Plus, daily updates, broker recommendations on Reckitt Benckiser, where to spread bet on the UK shares tax-free* and commission-free, how to trade... » read from top. A) Get free trading tips, offers, price updates, important news and more! All Free - Click here! © Copyright CleanFinancial.com 2007-2017. All rights reserved.